I was really hoping to include a shot of me sprinting through the Detroit Airport with my Merrell Barefoot shoes on but when you are racing for a gate that is that farthest thing from your mind so instead we will chat about taking them camping. So I know some of these shots are cheesy but I just figured out a cool setting on my camera. You can program it to take a huge number of shots on time intervals. I had a photographer use this once when I was modeling years ago. The opportunity for self-portraits is unlimited. I had a blast making these. Got a little over the top in some. While camping the only activity that that I did not have my Barefoots on for was horseback riding, the rest of the week my feet were tucked inside. They are so comfortable and freeing. I feel lighter with them on, much more stable than throwing on flip flops to walk anywhere. They did get dirty and will be in need of a wash now. My only complaint is that they started to accumulate a bit of sand and dirt inside that was hard to clear out. They sort of got gritty, I think a good brushing out will fix that. Josh had a similar issue last week when we went canoeing; he chose to wear his Barefoots in the water. After a bit they filled with sediment that he had some trouble cleaning out. It doesn’t make them uncomfortable just feels dirty. So the solution we have found is too wash them out, first a soak, then a scrub of the inside, follow with a towel out and let them air-dry. It takes about a day for them to completely dry, Josh will often just wear them wet, but that does nothing to help keep them clean. I hope this can help a bit if you too are starting to find that your Merrells are getting smelly. 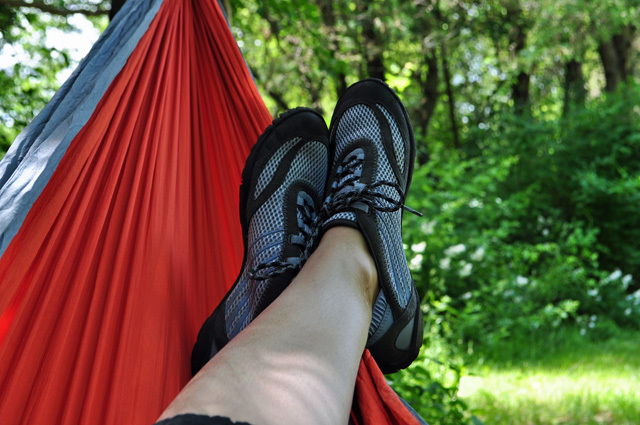 This entry was posted in camping, Going Barefoot and tagged Barefoot Shoes, Go Barefoot, Going Barefoot, Merrell Barefoot. Bookmark the permalink. 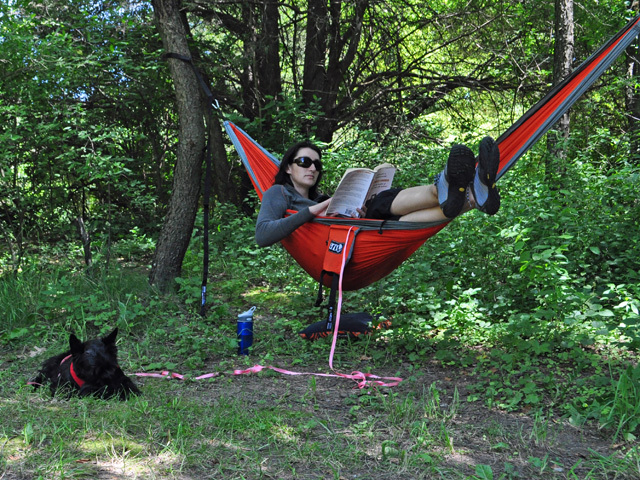 I love how Killer Dog pay no attention to mom dashing back and forth to the camera and hammock. Awww, but why isn’t Pippi IN the hammock as well! 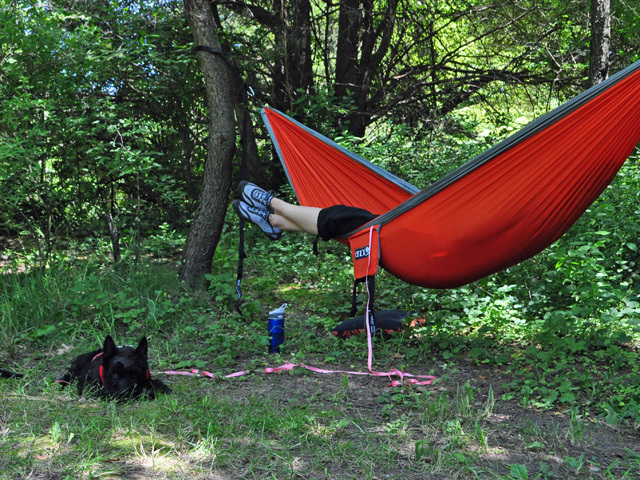 Hey, is that an ENO hammock? We just got one a couple months ago and did a post on it today – we absolutely love them. And, those Barefoots look pretty neat, too.